Trying to get the miles in during the build phase can be tough but this is a great time to really develop your stroke. The season we are focused on training, the off season is for feel and build so use it, experiment and develop a better stroke. Count your strokes: Work on increasing the distance covered per stroke to improve your feel for the water and your strength and stroke efficiency. Take as few strokes as possible from wall to wall and try to elongate each one. If you are at 30 strokes or above for 25 meters, try decreasing your stroke count by one or two per 25 each week. Decreased stroke count means increased efficiency, so a stroke count of 12 to 15 is far more efficient than a stroke count of 35. Golf drill: This is a fun drill to do with stroke count and speed. 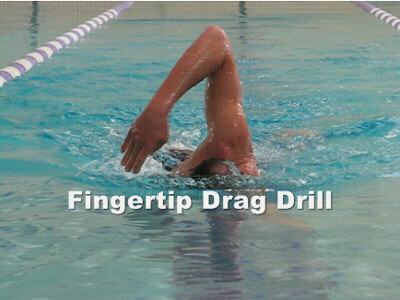 Count the number of strokes you take over 50 meters and add that number to your 50-meter split time. Now, as in golf, try to decrease your score by either swimming faster or taking fewer strokes. Rotate to breathe: Place a tennis ball under your chin. Swim freestyle, but as you turn to breathe, keep your head down and try not to let the tennis ball pop up. This drill is difficult, but is very helpful for emphasizing proper rotation and breathing technique. Keeping your head down in order to keep the tennis ball in place emphasizes proper head positioning, particularly in the breathing phase of the stroke. Proper head alignment is key as our legs drop to counter-balance a lifted head, ultimately creating more drag and a slower swim split. By keeping the tennis ball tucked securely under your chin you will ensure proper head positioning and minimize any leg drag associated with lifting your head to breathe.